Is your dog getting older, or he started to gain weight? Or was he diagnosed with a severe heart, kidney, or liver condition? In any case, he may need to change his diet to account for those circumstances, and usually, that includes a transition to a low-sodium regime. Sodium is a valuable mineral. It regulates hydration between the cells, it transmits impulses between neurons and has many other uses. In greater quantities, however, it can become toxic. Even though recent studies show that dogs are better at regulating their sodium levels than humans, in some cases, a special diet may be necessary. Sometimes, that can be temporary, and your pet can return to his normal food once the problem clears. Other times, it can be a permanent solution. How Much Salt Is Low Enough in Dog Food? What are the Benefits of a Low-Salt Dog Food? What do I look for in a Low-Sodium Formula? This guide should help you choose the best low-sodium dog food to help keep your pooch healthy longer. 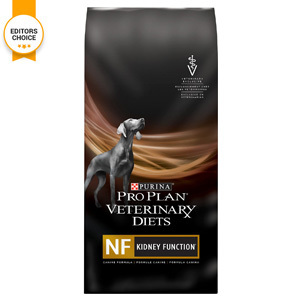 Our top choice among low-sodium diets is Purina Pro Plan’s renal formula. Part of their Veterinary Diets NF line of products, it is at the same time low in sodium and phosphorus, as well as protein, all to reduce the strain on your dog’s kidneys. While it contains less protein, about 12%, the protein that’s there is of higher quality, so your pet should have all the ingredients he needs to keep his muscles strong even when his health may be failing. Along with that, it contains whole grains as sources of vitamins and minerals, as well as fiber to help with digestion. It also includes supplements of vitamin B to protect your dog’s organism while not straining the kidneys. As it is meant for chronic kidney failure, this formula doesn’t include harmful artificial ingredients, such as preservatives, colors, or flavors, so it should be safe for pooches with sensitivities. Even though it is meant for chronic kidney failure, it can be used as a general low-sodium prescription diet for a wide range of conditions that require lower quantities of sodium. Among a selection of dehydrated food, The Honest Kitchen’s recipe based on beef and whole grains is our choice. The preparation is simple – all you need to do is mix it with warm water and leave it for three minutes before serving it to your dogs. And, if there are leftovers, you can even put it in your refrigerator for future use. The primary source of protein is ranch-raised beef, so your pup should get all he needs to keep his muscles healthy and lean. Oats, barley, and flaxseed provide fiber, while potatoes, carrots, apples, cranberries, and spinach provide the vitamins and minerals, as well as the energy, ensuring a well-balanced diet for your pet. As it contains lower amounts of fat and calories, it should be safe for older doggies, as well as adults who have problems maintaining their weight. It also doesn’t include artificial colors, flavors, or preservatives, so it should be safe for dogs with sensitive digestions. So, if you’re looking for a dehydrated formula that contains lower amounts of sodium, this is our recommendation. It has all the nutrients your pet needs from a balanced daily diet while avoiding ingredients that might strain his digestion. And since it is a low-sodium food, it should be safe for dogs with a wide variety of conditions. For the owners looking for a low-sodium diet that also protects your dog’s heart by including taurine, we recommend Wellness lamb and barley recipe. It is also rich in nutrients, so your pooch should get everything he needs for a fulfilling life despite the cause of his low-sodium requirement. Built on lamb as a primary source of protein, this formula should keep your dog’s muscles healthy and strong. Whole grains such as barley and oatmeal ensure maximum digestibility while also making sure all the useful ingredients are absorbed. At the same time, rice, peas, tomatoes, carrots, flaxseeds, and spinach provide all the vitamins and minerals your pet needs. It also contains chondroitin to preserve your dog’s joints, so it should be appropriate for older dogs, or pooches with joint problems. This is the top choice for canines who must be on a low-sodium regime due to heart problems. It provides all that, and more, and at the same time, it doesn’t include any harmful ingredients that would exacerbate the problem. This Royal Canin prescription recipe is specifically made for dogs with cardiac problems. It also has a moderate sodium restriction, so it should be safe for all but the most extreme conditions. Along with the reduced sodium, it also includes omega-3 fatty acids to maintain the health of your dog’s cardiovascular function. Carnitine, taurine, and arginine are also included, and they are known to help increase your pet’s cardiac health. It is also rich in vitamin B, as well as other vitamins, all to boost your pet’s immune system and make his life easier while he’s battling his cardiac issues. The primary source of protein is chicken, so it should provide all the extra protein your pet needs to stay healthy despite his medical problems. The whole grains should promote a high degree of digestibility, so your pet should get everything he needs without needlessly straining his heart or kidneys. We recommend this recipe for the owners looking for the best formula for their dog suffering from heart issues. It has all the ingredients to help boost cardiac health, as well as lower amounts of sodium and other components that can strain their heart. Even though this formula is primarily meant for canines with heart problems, it also protects kidneys. It has lower amounts of protein, about 12%, to help relieve the stress on kidneys, while at the same time containing enough antioxidants to maintain the health of your dog’s organs. At the same time, high levels of carnitine and taurine will ensure your dog’s heart remains healthy, and increased levels of B vitamins and magnesium help restore the nutrients your pooch may lose in treatment. Whole grain corn should ensure digestibility of this formula, so it should be safe for dogs with most sensitivities. In addition to that, this formula doesn’t contain any harmful artificial ingredients, flavors, colors, or preservatives, which also reduces the strain of your dog’s kidneys. So, if your pet has kidney problems along with cardiac issues, and needs a formula low in sodium, this is our recommendation. It has all the ingredients to protect the health of both organs, and it doesn’t have those that may strain them, making this the safest choice in that category. Normally, sodium is a necessary mineral. Your dog needs it, just like you, to maintain and balance fluid, to regulate blood pressure, and to transmit impulses in their nerves, muscles, cells, and brain. It is a vital nutrient, and its deficiency can be a serious problem. Unlike us, canines can flush the extra sodium out of their bodies. If your pet is healthy, sodium and salt, generally, shouldn’t be a problem. That doesn’t mean he can eat as much salt as he wants, merely that the excess sodium usually won’t have the same adverse effects it can have on humans. If your dog has health problems, though, sodium can turn to poison. And normally, the only time you should worry about the sodium levels in your pet’s food is if he has serious health problems (more on that later) that require a low-sodium diet. That is why you shouldn’t put your dog on a low-sodium diet without first consulting your vet. So, let’s say that, after consulting your vet, you decided to put your pet on a low-salt diet to help manage his symptoms. Except, according to the AAFCO, there are several levels of sodium restriction. How do you know which is appropriate for your dog? This section should help you understand these levels and their uses and the amounts of salt they allow. This category is meant for canines that have no conditions that require limiting the amount of sodium they ingest. Formulas without salt restrictions contain sodium amounts above 0.4%, or over 100 mg per 100 calories, as those are the upper limits of the next category. Unless your vet says otherwise, this is the food your pooch should eat. This class encompasses the formulas meant for middle-aged or older dogs, as they may need a reduction in sodium to keep their blood pressure down. And as increased blood pressure causes heart, kidney, and eye damage, it should be carefully monitored when your pet reaches a certain age. Diets with mild restriction usually have about 80-100 mg of sodium per 100 calories or about 0.3-0.4%. Again, you should feed your dog a restricted diet only if you notice symptoms and your vet approves. Diets with a moderate salt restriction are normally meant for canines with milder cardiac conditions (such as an enlarged heart) or those in the early stages of kidney failure. These formulas normally contain about 0.2-0.3% sodium or about 50-80 mg per 100 calories, and they are usually administered with medication. Most of these diets can only be obtained by prescription, so you should only start them after consulting your vet. This group is meant for the most severe cases, such as congestive heart failure, or in the later stages of kidney failure. These formulas are only prescribed if the condition persists when your dog is on a moderate regime with medication. Usually, they contain under 50 mg per 100 calories, or about 0.2%, with the more restrictive formulas even going under 20 mg per 100 calories, or under 0.15%. As we’ve mentioned earlier, low-salt diets are normally only required if your dog has a medical condition. This section should cover the most frequent problems that necessitate a reduction in sodium levels. There are many causes of congestive heart failure among dogs. It can be a result of a congenital defect, or it can be a result of old age, injury, infection, or parasites such as heartworms. It can also happen because of a bad diet or lack of exercise. So, if you notice any symptoms of heart problems, such as difficulty breathing, coughing, or decreased energy levels, consult your vet immediately. If caught on time, with proper medication and diet, your pet can live for months, if not years after diagnosis. Your vet should also be able to tell you how restrictive your dog’s diet needs to be, and how much exercise he needs to make a full recovery. Liver failure is another common disease which requires a low-salt diet. It can be a result of poisoning, for example, with antifreeze, alcohol, herbicides, or similar; congenital defects can be a factor, as well as infectious diseases such as hepatitis, or endocrine disorders such as diabetes. Treatment depends on the cause, and it can vary from diuretics or enemas to flush the toxins from the system to surgery in the more serious cases, such as liver cancer. Recovery from both the acute problems and from chronic failure can include a diet low in sodium and protein. Kidney failure can also be acute and chronic. The former can also be a result of poisoning, while the latter can happen with old age, or because of congenital factors, or a poor diet. So, if you notice a change in your dog’s water consumption or urination, weight loss, vomiting, or diarrhea, consult your vet immediately. Acute kidney failure has a high rate of successful treatment if caught in time; otherwise, it can develop into a chronic condition. If your pet has kidney problems, sodium will increase water retention and with that, his blood pressure. That will, in turn, increase the stress on his already strained kidneys. That’s why a good renal diet should contain lower amounts of sodium. This is a condition most commonly caused when your dog eats large quantities of salt. After ingesting that much, your dog will lose vast amounts of water in his digestive tract, and it can lead to high blood pressure and heart problems. It is usually characterized by uncontrollable thirst, increased urination, confusion, seizures, vomiting, or diarrhea. If you notice your dog displaying these symptoms, take him to your vet immediately. It is treatable with fluid therapy, as well as with a low-sodium diet until the proper balance is restored. Formulas with lower sodium don’t have to be meant exclusively for dogs with medical conditions. They can have advantages even for healthy canines, and in this section, we will show how your pet can benefit from such a diet. However, more restrictive diets should only be used when there is a medical condition. Diets with lower amounts of salt can help with hydration. Salty food absorbs liquids in the digestive tracts. That can, in turn, lead to higher thirst, and excessive amounts of water can lead to high blood pressure or kidney problems. That includes their regular meals, as well as any treats your dog may get between them. Wet dog food is also a great way to keep your dog hydrated. Just like with humans, sodium increases blood pressure in canines. High blood pressure can cause all kinds of other issues, from problems with circulation to heart and kidney diseases. And if your pooch already has some of these problems, high blood pressure will only make things worse. That is why reducing their sodium intake will lower their blood pressure, which will reduce the load of your dog’s vital organs. Older canines are more prone to heart or kidney problems, and diets with a mild sodium reduction are recommended to help protect their organs from age-induced degradation. The effects of high blood pressure are also more pronounced in older dogs. And with better hydration that comes from a low-salt diet, there really aren’t any disadvantages to choose such a diet for your canine elder. Try out one from our specialized list of dog food for senior dogs. Dog food selection can be difficult even when your pooch is healthy. There are so many ingredients you should look out for, and other factors can make things even more complex. If your pet has a medical condition, things get even more difficult. This guide should give you all the information you need to make an informed decision about your pet’s diet. As with most formulas, if you’re buying low-salt food, you should make sure the source of protein is named and of high quality. Higher quality protein sources reduce the strain on your dog’s metabolism and help protect from deterioration while providing the building blocks to heal his ailing organs. If your pet also has problems with his kidneys, the amount of protein should be lower than usual, as higher amounts increase the stress on his organs. Carbohydrates provide the energy your dog needs daily. When choosing the source of carbohydrates, whole grains such as oatmeal, flaxseed, brown rice, or quinoa are generally a better source than wheat or corn. Whole grains provide more fiber, which is why the carbs are absorbed slower. That helps avoid sudden blood sugar spikes, which can be detrimental in the long run. When possible, the chosen formula should provide natural sources of vitamins and minerals. Mostly, they come from fruits and vegetables. Those are easier for your dog to digest. You should also pay attention to other supplements such as omega fatty acids or glucosamine and chondroitin. The former provide care for your dog’s skin and coat, as well as the brain, eyes, and immune system, while the latter protect the health of his joints. You should make sure you know where your dog’s food and its ingredients come from. It should be from a region with high quality and safety standards. Usually, that means that the ingredients coming from the USA, Canada, Western Europe, Australia, or New Zealand are safer than other places. While protein should generally come from a named source, you can choose a recipe that contains meat meals or by-products as secondary sources if they are clearly identified. If the formula lists simply ‘meat meals’ or ‘meat by-products’, you should avoid feeding it to your pet, especially if he has food sensitivities or allergies. If your pet requires a low-salt diet, chances are he may not be as active as earlier. If that’s the case, he may need a formula with a lower caloric value to help maintain his weight. After all, should he gain weight, it could exacerbate the problems. That’s why you should make sure the chosen low-sodium diet also contains fewer calories. Most weight-loss formulas normally contain less sodium, so unless your dog’s condition is severe, he may benefit from something like that. Of course, you should consult your vet before making changes to your pet’s diet. If your pet has other problems, you should make sure your chosen formula reflects them. Don’t choose a recipe containing ingredients he may be allergic to, for example. If he has kidney problems, his formula should contain less protein. Foods with chondroitin and glucosamine can help your pet has problems with his joints. Now that you know what to look for when choosing the right low-salt food for your pet, you should also pay attention that the recipe doesn’t include these ingredients, as they can be detrimental to your dog’s health. Monosodium Glutamate, or MSG, is salt used in cheap food and treats, and it has been known to cause severe symptoms in dogs. It is most prevalent in cheap, heavily processed food, and you should choose a formula, as well as treats, completely free of it. Sodium nitrate is an FDA approved preservative used to keep meat fresh. In smaller quantities, it is generally harmless, but when it exceeds 8 mg/kg, it can cause methemoglobin, a canine blood disorder. When combined with other ingredients over time, it can also increase the chance of cancer. As it also contains sodium, it should be avoided in a low-salt diet. There are many ways you can approach homemade food. You can use it to add more nutrients to commercial food or to dilute the more nutrient-packed formulas. And, if you’re having troubles finding the right commercial formula, you can even use homemade food exclusively. Does wet food have lower sodium than dry food? There is both dry and canned food with lowered amounts of sodium, so the choice basically depends on your pet’s preferences and health. Canned food does have a clear advantage in one aspect, though. It is the better choice to keep your pet hydrated, which can be extra beneficial if he has an ailment that requires a low sodium diet. Are there low sodium dog treats? Yes, there are both commercial and homemade low-salt dog treats. For an idea of healthy homemade treats, you can consult this guide, and from a wide selection of commercial treats, we recommend Purina Pro Plan’s Lite Snackers. What is the best low-salt brand for senior dogs? If your elderly pooch doesn’t have any other serious conditions, our choice is Wellness Complete’s formula based on lamb meat. If, however, he suffers from ailments that require a more severe restriction, we recommend our top choice, Purina Pro Plan’s Veterinary Diets recipe. Before changing your pet’s diet, though, you should consult your vet and see if there are any other considerations you should look out for. Switching to a low-salt diet can be difficult, as the food usually isn’t as tasty as normal dog food. And if your pet developed a medical condition, his appetite may become weaker, which only makes the whole situation even more complicated. That’s why a good low-sodium diet is essential: it will motivate your pet to eat more. That will give him more energy and nutrients to fight off the disease, and it will also reduce stress on his vital organs. Our top choice, Purina Pro Plan’s Veterinary Diet formula, should cover most of these bases and it should be top choice. And if your pooch doesn’t like that recipe, our other choices provide even more options, so you’re sure to find something he likes. And, after reading our guide, you should have all the information you need to make an informed decision regarding your pet’s food and health.